Unlike the marathon, it turned out exactly as I imagined it would. A quick digression to explain before we proceed to cheesy heaven: it was not my best marathon, though I’ve now only run two. It wasn’t the same sort of transcendence, the same wonder. It was tough. It was warm. It was humid. It was a strange day of being unable to find my own pace — whether it was because I had been up and traveling for six hours before cannon time all the way down in Staten Island, the fact that so many people around me were passing me in the beginning even though I was going faster than I intended, or that I just psyched myself out, I’m not really sure. In an effort to slow my too-speedy start, I slowed down too much, and couldn’t feel what has always been “my” pace. I’m always consistent. I couldn’t find my consistency last Sunday. 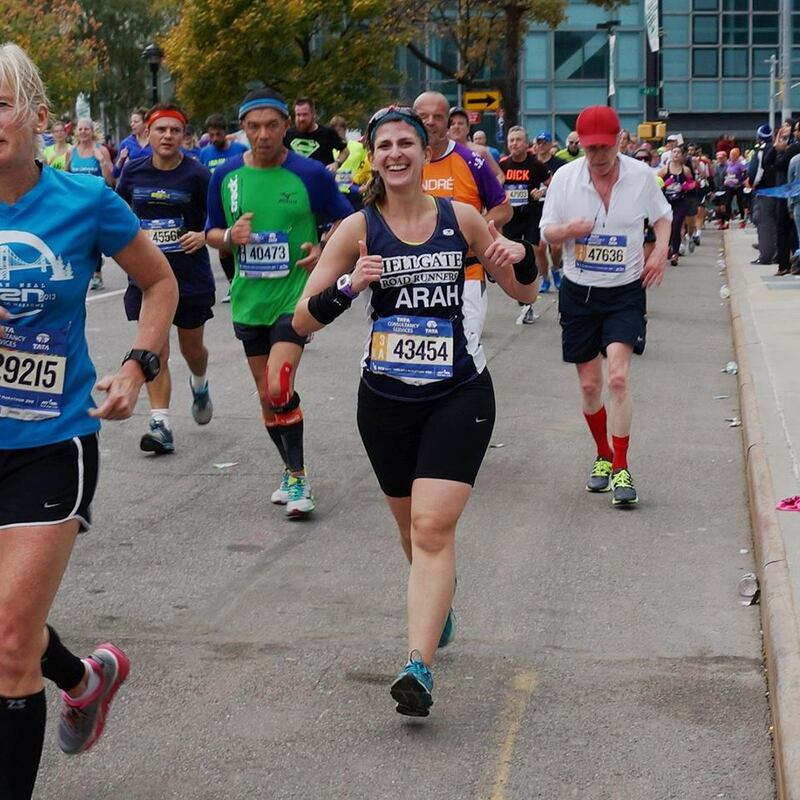 But still, when my good friend Bethany left me just before the entrance of Central Park, keeping me focused and motivated to just put one foot in front of the other for the two miles she was with me in Harlem and down into the Upper East Side, I found another gear. I ramped up my pace with 2.2 miles to go, knowing my park like the back of my hand, passing runners who had passed me early on. I sped to the finish faster than my goal pace, finally, relieved of some burden that had weighed me down for miles and miles before, despite so many friends and strangers out there cheering me on. It wasn’t the time I wanted, but it was the finish I wanted. And I’m damn proud of that. But back to the mac and cheese, because that’s why you’re here, isn’t it? Runner and non-runner alike. 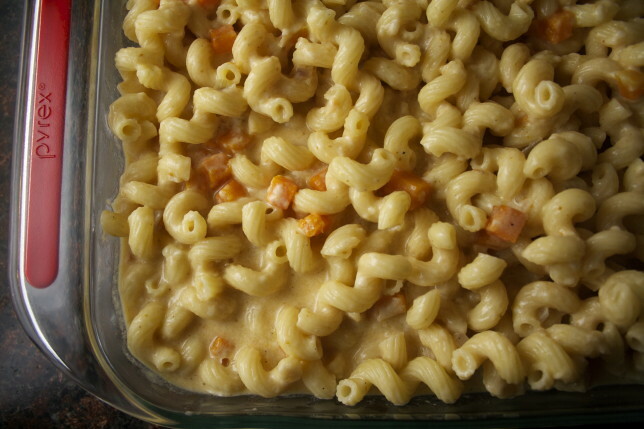 Mac and cheese, in and of itself, is comfort. It coats your bones when you’re cold. It’s a warm hug when you’re blue. I think I’m pretty much over the fact that the race didn’t go as I had planned, but I still need a hug. And what better than a hug tinted with pumpkin and baked with butternut squash, melded and melted with three kinds of cheese and highlighted with shallots, sage, and nutmeg? Nothing. Nothing is better than that. 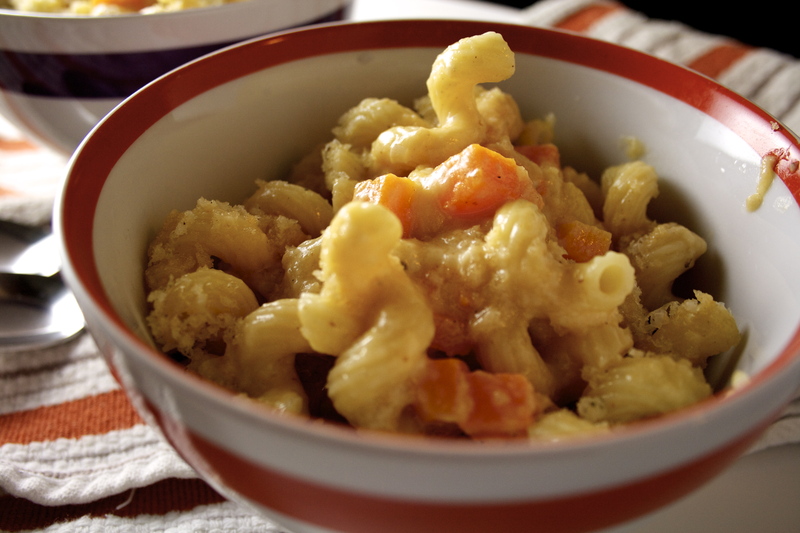 This mac & cheese smacks of sophistication. It’s delicate but bold. 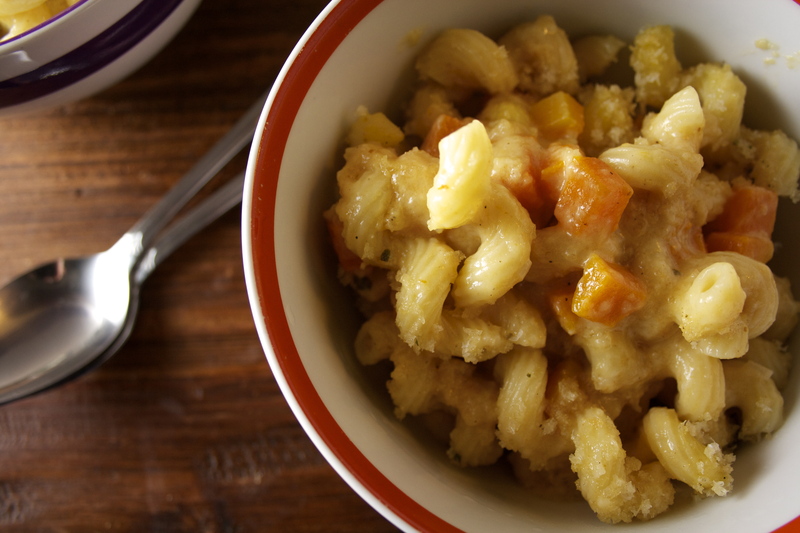 Savory with a hint of sweetness from the squash and pumpkin. And creamy, so creamy, from the extra sharp cheddar, monterey jack, and parmigiano reggiano. I love the contrast in textures, from the tender bite of the butternut squash to the crunch of panko topping. These flavors and textures don’t lay on top of each other like a strata, no. They create a beautiful amalgam, much like the gorgeous palette of a forested mountain at peak foliage. It’s what happens when you’re really hungry but craving something new. When your mind is relieved of the single-minded goal it pursued for months, relieved of the stress of performance, of time commitments. When you realize that you really haven’t been all that kind to yourself these last few months, when you’ve needed it most. But with all your favorite ingredients just an arm’s-length away, you promise yourself you can start again, through a new door. Bring a pot of water to a boil with a handful of salt and cook pasta according to instructions. Drain and set aside. Meanwhile, heat up 1 tablespoon olive oil in a dutch oven over medium heat. 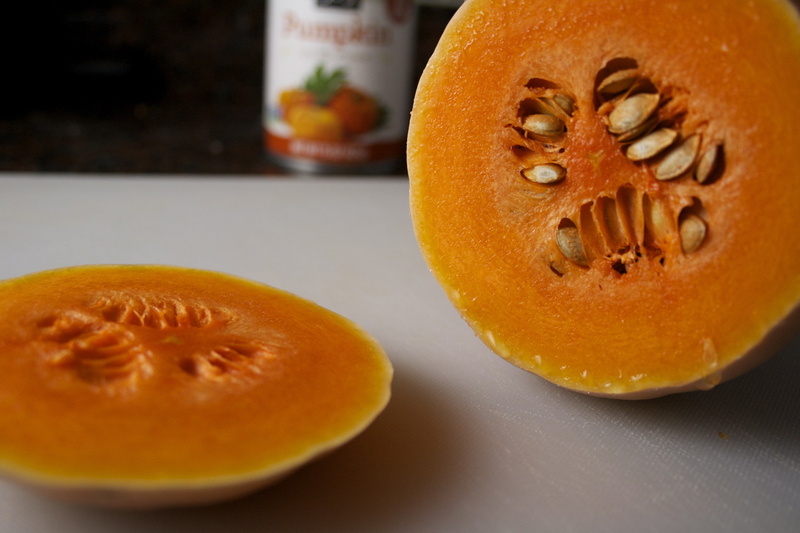 Add butternut squash and a sprinkling of salt and saute until softened, about 6-8 minutes. Remove squash from pot and set aside. 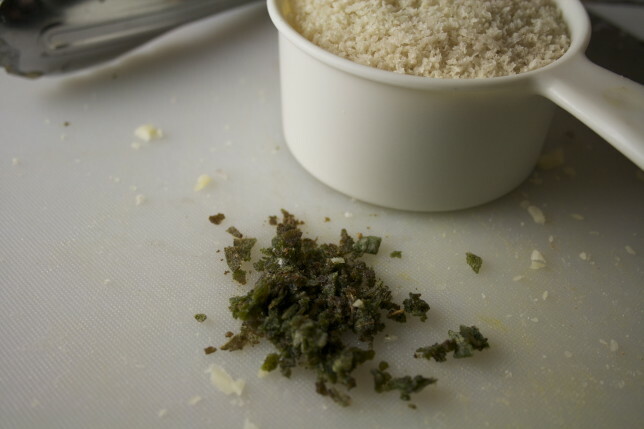 Melt 4 tablespoons butter in the dutch oven and add sage leaves until they begin to crisp. The butter will start to brown — that’s okay, it helps give this dish a lovely nuttiness. Remove the sage leaves and set aside. Add the minced shallot and cook until softened, about 30 seconds. Add 4 tablespoons flour and stir until combined. Add milk. Continue to heat until the milk is hot, stirring to ensure it doesn’t scald. Add the pumpkin and stir to combine. Add ⅛ teaspoon freshly grated nutmeg and a few grindings of black pepper. Lower the heat to low and add the cheese a handful at a time, stirring constantly, until the cheese is melted. Add the reserved squash and stir. Taste and adjust the seasoning, adding more pepper, salt, or nutmeg if needed. Take the sauce off the heat and add the pasta, tossing to combine. Pour into an 11 x 13 inch baking dish. Melt the remaining 4 tablespoons butter in a small bowl. Add the panko, a few more gratings of nutmeg, a few more grinds of black pepper, and a pinch of salt. Chop the reserved sage leaves and add those to the mixture. Stir until well combined. 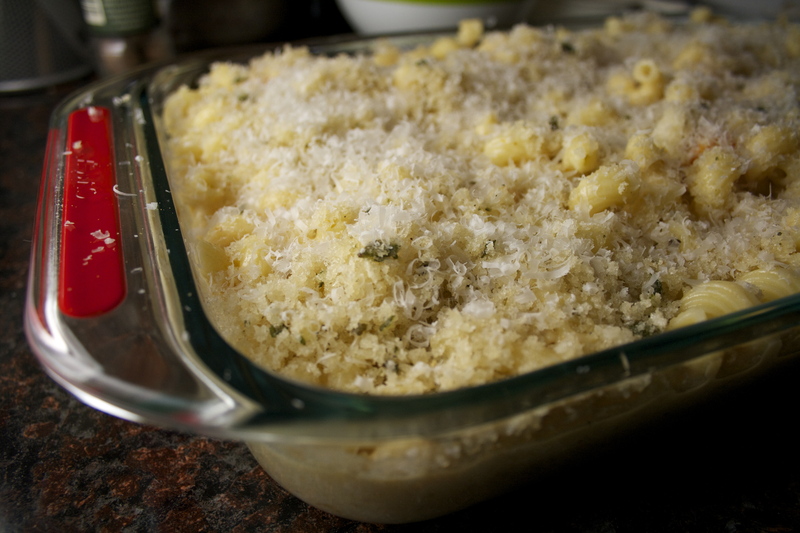 Distribute the topping evenly over the prepared pasta. Grate parmigiano reggiano in a light, even layer over the topping. Bake for 15-20 minutes. Let cool just a few short moments before serving. I’ve been lucky to know Sarah from my days running with her in NYC, and I knew that I’d have to make one of her recipes one day. And I’m glad I did. This mac’n cheese is heartwarming, showstopping, creamy, flavour-infused inspiration straight from the oven. After a long run on a cold day down in New Zealand this warmed me up and brought me ‘home’ again. And the smell while baking is sure to peak everyone’s interest. Perfect stunner of a dish! Thank you Sarah! So glad I could help you feel back at home, Sam! Amazing! I recently made a butternut squash mac and cheese (but no pumpkin! ), and I can say it was one of my favorite things I’ve ever made. Yours sounds so good too!